1. The novel takes place during World War II. Is the war setting a distraction or does it contribute to the success of the novel? Would changing the time frame change the meaning of the novel? 2. “What I learned over the past year was that monsters abound, usually hiding in plain sight.” Monsters come in all different forms in At the Water’s Edge. What are some of the monsters in the novel? How are they different from what you’d expect? 3. 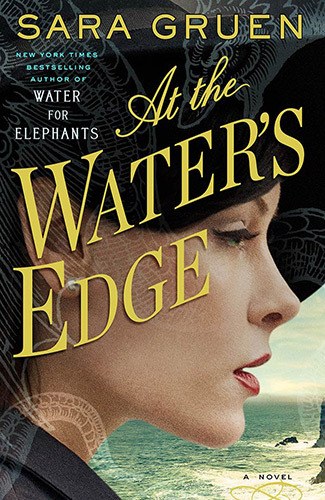 Throughout At the Water’s Edge, Maddie transforms from a woman who is spoiled, naïve, and helpless to one who is brave and capable. What and who are the major influences that lead her to change? What are the biggest lessons Maddie learns throughout the course of the novel? 4. Discuss the novel’s ambiguity toward the supernatural. How does Gruen blend mystical elements into the narrative’s realism? Do Ellis and Hank find the Loch Ness monster after all? 5. Do you think Maddie and Ellis were ever truly in love? What did you think of Ellis? Did you sympathize with him? Did Ellis change as a character in the course of the novel or did the changes all take place within Maddie? 6. The idea for At the Water’s Edge came to Sara Gruen during a visit she took to Scotland. She became fascinated with the ruins of old castles, the wild beauty of nature, and Scottish history and folkore. Discuss the role the landscape and atmosphere of Scotland plays in the novel. 7. At the Water’s Edge explores humanity at its most base, as well as its most noble. Can you give some examples of both from the story? In the end, what kind of statement do you think Gruen makes about human nature? 8. Before she goes to Scotland, Maddie only has Ellis and Hank as friends. How does the female friendships she develops in Scotland shape her in new ways?